Title: Why my transactions don't post through GL even when I have the flag selected? Description: Are you tired of asking why is it that some transactions do post through GL and why some don't? Tired of changing the posting settings to no avail? This issue outta be one of the most confusing issues for users and consultants, new or seasoned alike. If you ever struggle with one issue in GP, please tell me it's this one, because even today, I cannot claim victory over this subject. So let's walk the walk together. 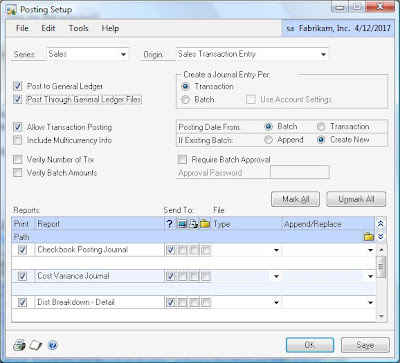 For example, voided transactions are handled like transactions posted individually. This is, when the void occurs, there will be a batch created in GL waiting to be posted. 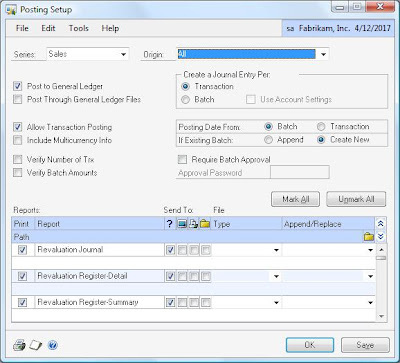 The Bank Reconciliation module, even though it allows to save most transactions, it does not allow for Post Through GL to take effect. This is because all transactions in the Bank Rec module are treated as individual transactions. In fact, all Bank Rec transactions are treated as individual transactions. Since post through GL was conceived for the core Dynamics dictionary modules, chances are that you will find only a few ISVs following the posting rules. Most integrating products will play safe and allow a batch to be created for review and future posting in the modules they integrate with. In this case you may want to review the all too famous (or infamous) Origin drop-down in the Posting Setup window. I have seen cases where users have set the Post Through GL flag for a few transaction types in the application series, but had the unfortunate luck to set the Origin drop-down to All and click on the Save button. This will overwrite every individual setting for each transaction within the series and will change all posting settings! Not a good thing if you have spent a few hours customizing each transaction setting. Hope this post help in clarifying some of the confusions.